As a complement to my previous post February U.S. Temperature – 8.26 F cooler than the warmest February I thought it would be interesting to look at large state, in this case California, the third largest state with an area 423,970 km2 (163,695.57sq mi). And the biggest when it comes to population (37,253,956 April 2010). California is the same size as Iraq. And is much bigger than Japan and Germany. This February is – 2.63 F degrees cooler than the average for 1900-2011. 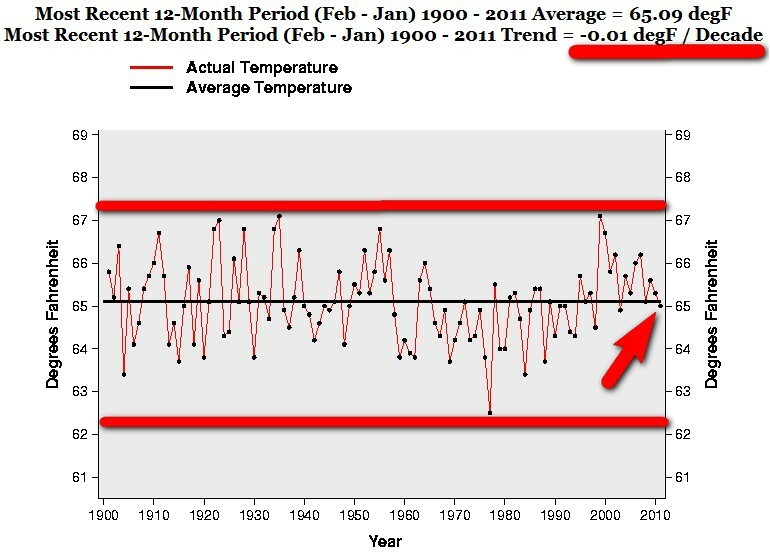 And the “warming trend” 1900-2011 is exactly 0.08 F degrees a decade. That is a whopping 0.8 F warmer in 100 years. Take cover! And notice the dramatic rise from 1933 to 1934. A rise of 8.6 F degrees. Another big rise from 1962 to 1963. A rise of 7.9 F degrees. Followed by nearly as a big drop 1964. A drop of – 7.6 F degrees. And California did not cease to exist because of this “catastrophic” rise in temperature as the Global Warming Hysterics want us to believe. Nothing happened. Everything went on as normal. There are other years in the chart when the temperature increases 6.6 – 8.3 F in one year. And still, somehow mysteriously, California went on as normal. But an ACTUAL RISE OF 8.6 F degrees IN ONE YEAR is nothing. This year, the Dec- Feb temperature is – 3.1 F cooler than 1981, the warmest Dec- Feb. And if we compare this year’s Dec- Feb with 2006 and 1995 it is – 1.5 F cooler. This recent 3 months is 0.46 F warmer than the average for 1900-2011. 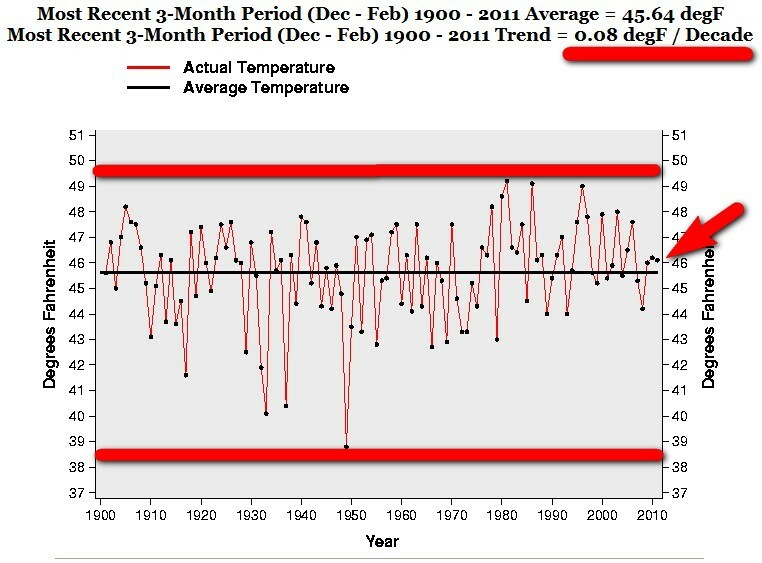 And the “warming trend” 1900-2011 is exactly 0.08 F degrees a decade. This year, the Mar – Feb temperature is – 1.9 F cooler than 1927, the warmest Mar – Feb. And if we compare this year’s Mar – Feb with 1905 it is – 1.7 F cooler. This recent 12months is – 0.03 F degrees cooler than the average for 1900-2011. 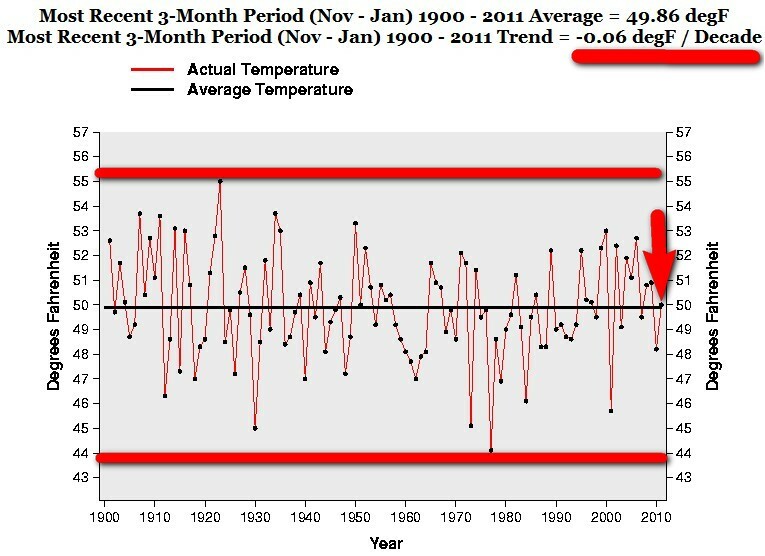 And the “warming trend” 1900-2011 is exactly 0.09 F degrees a decade. 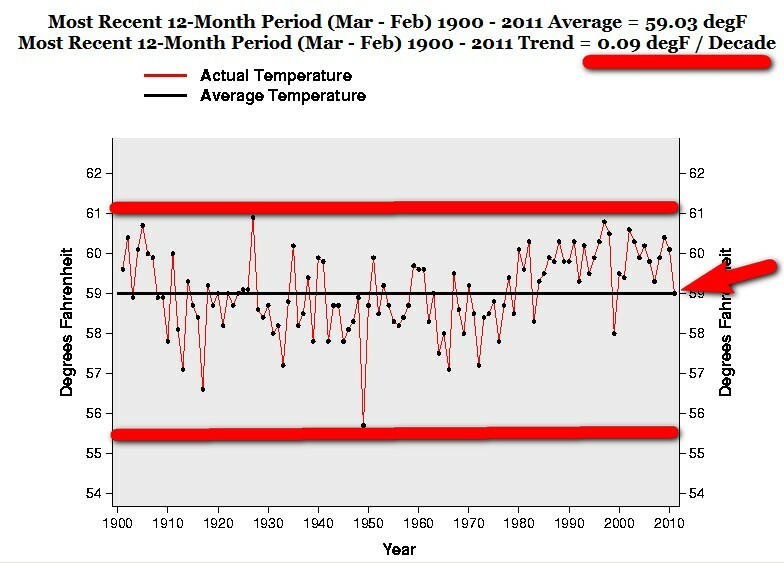 The February “warming trend” 1900-2011 is exactly 0.08 F degrees a decade. 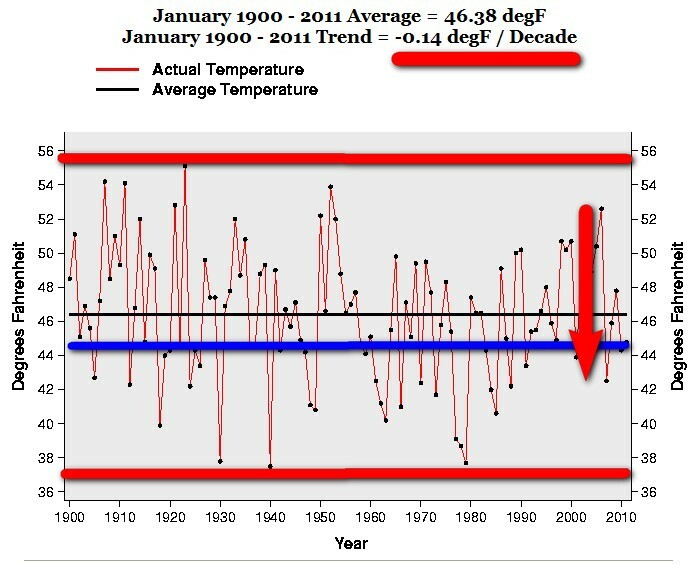 The Dec- Feb “warming trend” 1900-2011 is exactly 0.08 F degrees a decade. 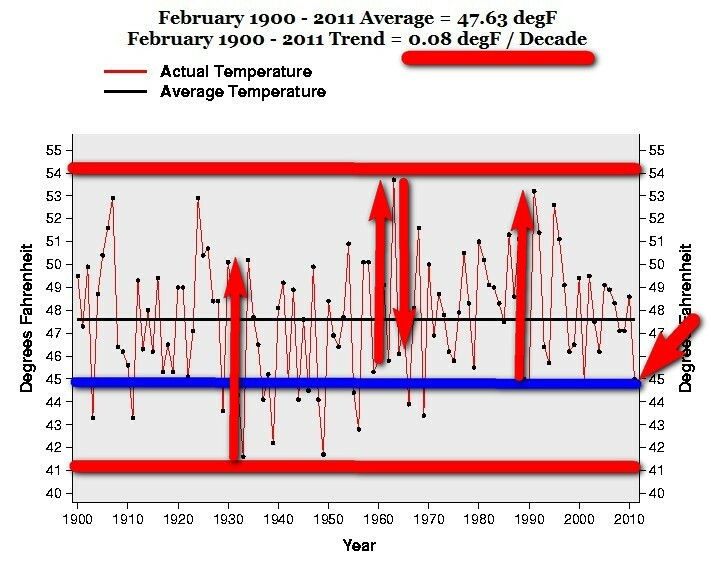 The Mar – Feb “warming trend” 1900-2011 is exactly 0.09 F degrees a decade. That is truly “Global Warming” Californian style.